Faith and Revelation: Scott Hahn, Scripture and Substance! So You Wanna Learn About Scripture? In my opinion, one of the best books that you can read is Faith and Revelation (Knowing God Through Sacred Scripture) written by Dr. Scott Hahn (copyright 2009, Midwest Theological Forum) and edited by Fr. James Socias. Part of the Didache Semester Series, this volume delivers the same solid Catholic teaching that can be found in the other books of this series. As stated on the back cover, the goal of the Didache Series is “to present the basic doctrinal, scriptural, moral, and sacramental tenets of the Catholic Church in a manner that is both comprehensive and accessible.” In my mind, they accomplish that goal in a BIG way! 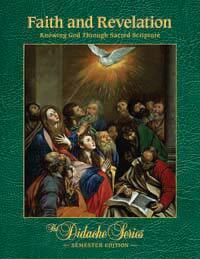 – A beautiful design with color reproductions of religious artwork throughout. – Lots of substance (multiple citations from the Catechism and Church Council documents plus numerous quotes from the Church Fathers). – Material is presented in an easy to understand manner. Although designed to be a high school text book (spanning one academic semester), I would recommend this book to any adult who desires to learn more about the Bible, from a Catholic perspective. The biggest mistake that Catholics often make when reading Scripture is to read it “in a vacuum”, ignoring the fact that the Catholic Church actually compiled the books of the Bible. Faith and Revelation rectifies that mistake, by giving you Biblical insight combined with solid Catholic teaching. Still not convinced? Take a look at this preview to see for yourself! For more information or to order, visit the MTF website. Posted in: Bible, book reviews, books, Scripture, Uncategorized.